1. ColourBurst Matte Lip Balm by Revlon - Colour: Sultry. 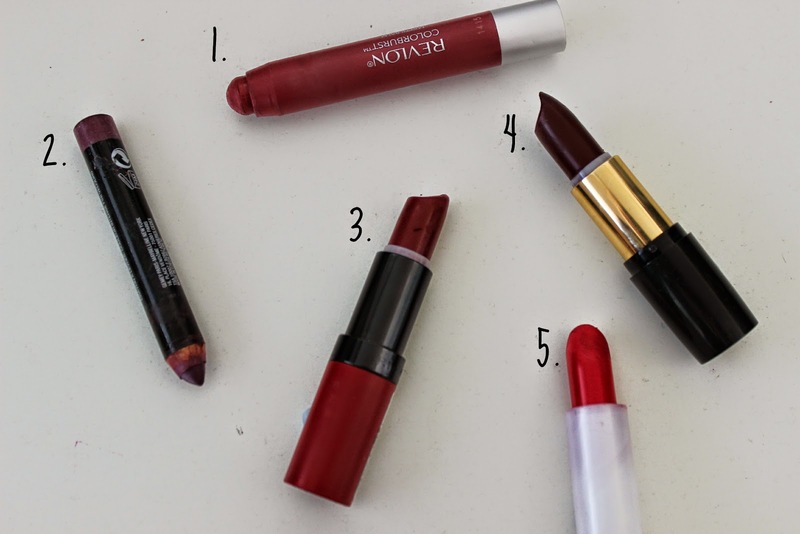 I thought I would start of 'Top 5 Friday' with my 5 favourite Drugstore lipsticks. I am a massive lipstick and lip gloss fan so to pick my favourite ones was actually quite difficult. Wearing lipstick is a staple look for me; I rarely leave the house without it on, I feel like my make-up routine just isn’t complete without a good old bit of colour on the lips and then I am good to go. I tend to not own many higher branded ones as I am very much on a budget, but when I do like to splash out on make up, I absolutely LOVE the Channel Matte Lipsticks. They are long lasting, moisturising and they come in a great shade of colours. Today, I have included two lip crayons and 3 lipsticks. I tend to wear a lot of lip products which leave a matte finish, as just a personal preference. I think all of these colours are perfect to wear throughout the day and onto the night, whilst going with any outfit. They are long wearing, which is what I need as a I spend long days at University and for them to be able to stay on all day is great. I also like them for their moisturising factor because I suffer from quite dry lips, espically during the autumn/winter months. What Drugstore lipsticks are your favourites? Are there any I should try?